I Found It! The Gift For The Person Who Has Everything! 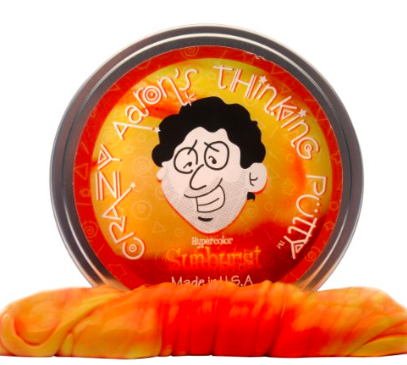 This is it – the gift for that impossible to buy for person on your list:Crazy Aaron’s Thinking Putty. I friggin’ love this stuff! It’s an all-play toy meets office desk that’s good for all ages. This isn’t your ordinary putty – there are several different kinds and they all do something pretty amazing. For starters, they bounce like crazy. And then there are special puttys – like the Hypercolors. (Hover over each one on Amazon to see which are the Hypercolor). They are heat sensitive and change colors when you touch them. I purchased this at my local Learning Express. The girl there working said that the Super Scarab is a good starter and Cole got himself one of these with a credit he had. It apparently shows no dirt and is extra bouncy. I bought a couple of these for my teenage niece and nephews, for Nate (12) and even for an adult on my gift list who is over 40! You can find more information on them at PuttyWorld.com or see all the buying options on Amazon.